It’s beginning to look a lot like winter, and decreasing temperatures bring increasing options for fun. Just in time for below freezing temps, we have compiled a list of the best place in your state for a winter weekend getaway or even just a day trip. Travel can be stressful this time of year, so an in-state destination might be the ticket to keeping up the holiday spirit. From chasing the Northern Lights in Alaska to skiing in Jackson Hole, Wyoming, we offer up 51 fabulous, frosty fun places. Arranged by state, some places are permanent like the pristine white sugar sand beaches along Alabama’s Gold Coast while others are ephemeral like the New Year’s Eve festivities in Key West that include a conch shell drop. 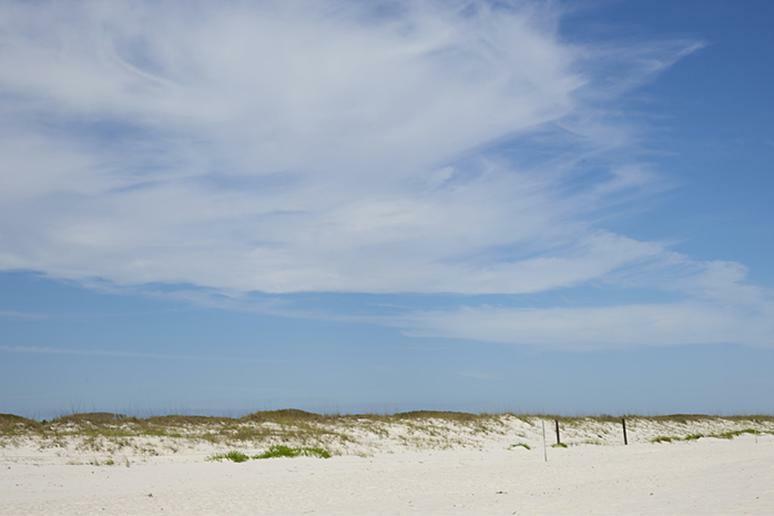 The best place to visit in Alabama during the winter is the beach. With 32 miles of white sugar sand beaches along the Gulf of Mexico, it is easy to put your toes in the sand at Gulf Shores and admire the turquoise waters while the majority of the U.S. experiences freezing temps. 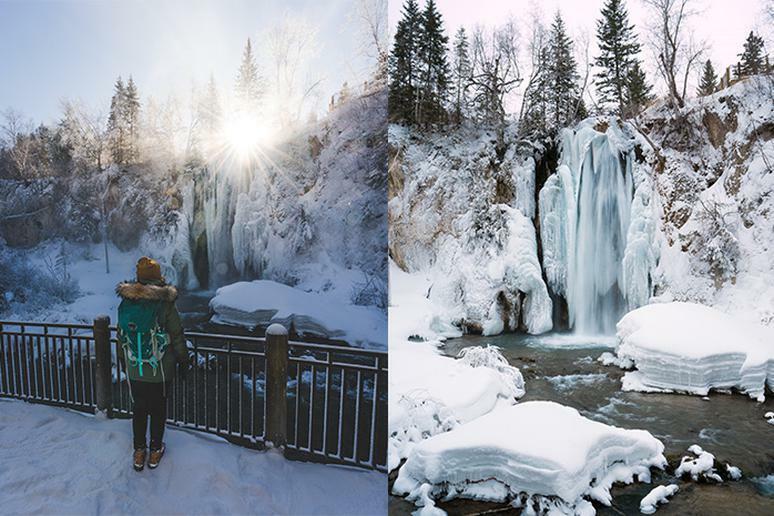 Alaska is a winter wonderland, but you’ll get a good idea of all that Alaska has to offer in the winter in Fairbanks, Alaska. 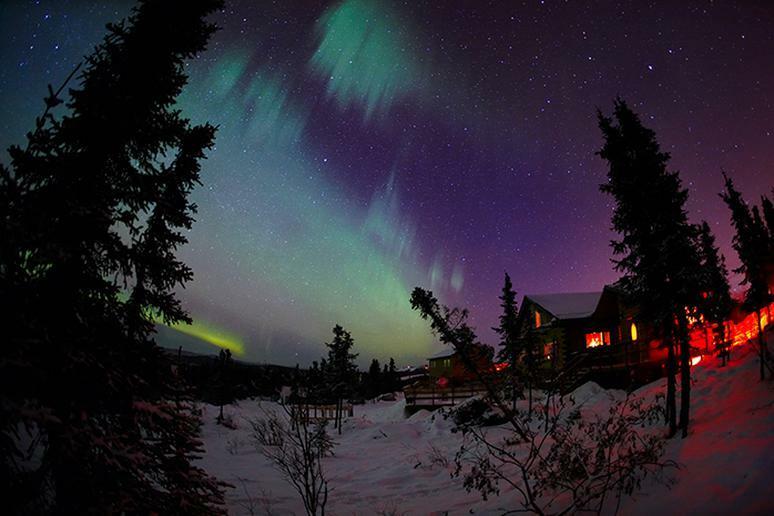 The Interior Alaska community that is home to a university, an Army base, and an Air Force base, is known for epic aurora viewing and outdoor excursions like dog mushing and snowmobile trips. The most magical part of visiting Fairbanks in winter is viewing the dancing green and purple Northern Lights (the aurora-viewing season runs August 21 to April 21). Fairbanks sits under the auroral oval, a ring-shaped region around the North Pole, which offers a great balance of occurrence, frequency, and activity of the Northern Lights. First-time visitors should plan to spend at least three nights, which gives visitors a 90 percent chance of spotting the lights. Fairbanks is also a short drive from the world’s largest year-round ice environment, the Aurora Ice Museum, and the relaxing thermal waters of the Chena Hot Springs. Visiting the Sonoran Desert of Arizona is perfect in the wintertime when much of the rest of the country is under snow. One of the best places to visit in Arizona in the winter is a dude ranch. There are two in the Tucson area: White Stallion Ranch in western Tucson and Tanque Verde Ranch, the state’s best hotel located on 640 acres in the Rincon Mountain foothills just east of Tucson. White Stallion Ranch has 3,000 acres of wide-open land at the foot of the ruggedly beautiful Tucson Mountains, adjacent to the Saguaro National Park. There is western-style horseback riding with the wranglers, scenic trails, cookouts, steak barbecues, hayrides, and rodeos. Amenities include a heated pool, a hot tub, tennis courts, volleyball, horseshoes, billiards, a petting zoo, and a full bar. Tanque Verde Ranch offers desert horseback riding, hiking, mountain biking, nature walks, tennis and more. A working dude ranch, Tanque Verde features a wide range of activities for adults and children. The Ranch’s 74 rooms offer desert and mountain views, and many include patios and fireplaces. 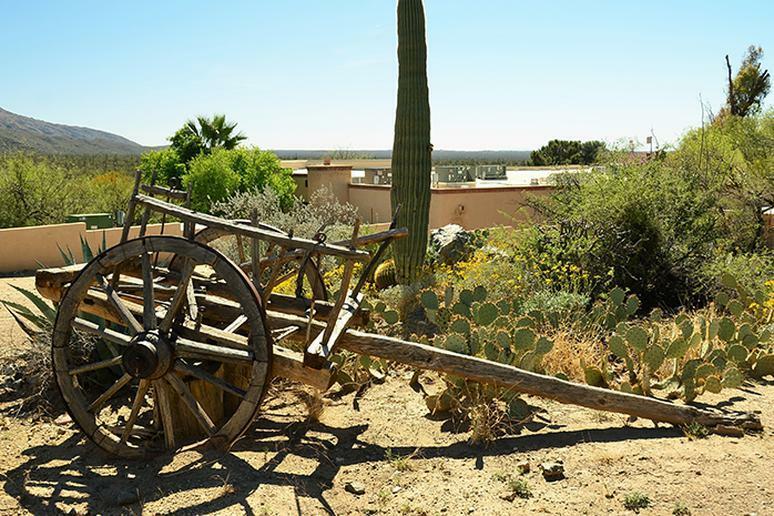 Tanque Verde is recognized as one of the last luxurious outposts of the Old West. This historic ranch, founded in 1868, is adjacent to the Saguaro National Park and Coronado National Forest. Most guest rooms are spacious and have adobe fireplaces and outside private patios, with spectacular desert and mountain views. 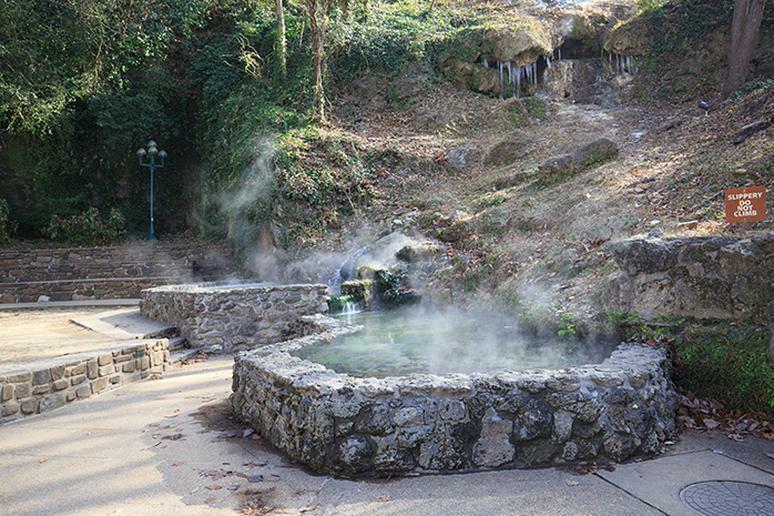 Among the national parks in Arkansas is Hot Springs National Park, which holds the title as the oldest unit within the National Park System. The park's springs are the reason the park was first set aside for protection, and the thermal water can be found in everything from spa treatments on Bathhouse Row to beer at Superior Bathhouse Brewery, the first brewery located inside a national park. Along with hot springs, the city also the Historical Baseball Trail that documents the city’s history in the sport via historical markers that are located throughout the city; The Gangster Museum of America that focuses on the 1920s-1940s era of the town, when a number of infamous gangsters, such as Al Capone and Lucky Luciano, vacationed here; and a renowned arts community with plenty of gallery options. 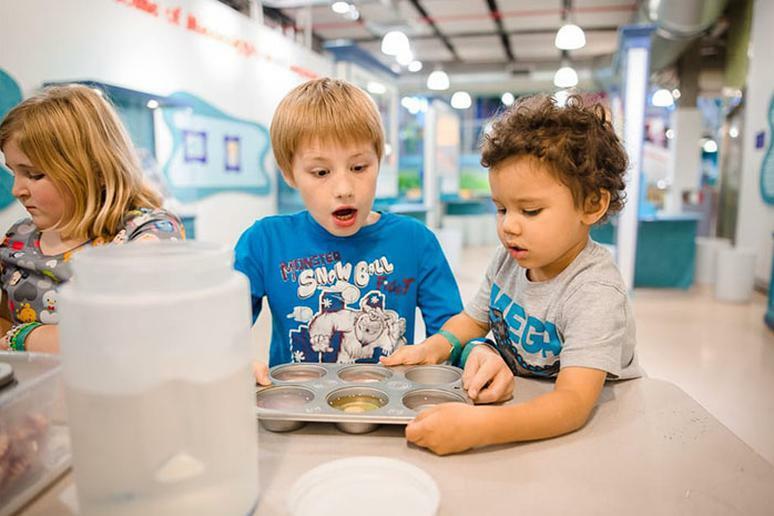 The Mid-America Science Museum is also a great stop for families. First time visitors should also spend time visiting the shops and art galleries downtown on Central Avenue. Boasting a crystal clear blue lake surrounded by 11 incredible ski resorts, Lake Tahoe in California’s High Sierra is a popular destination for visitors who love outdoor adventure and winter sports. 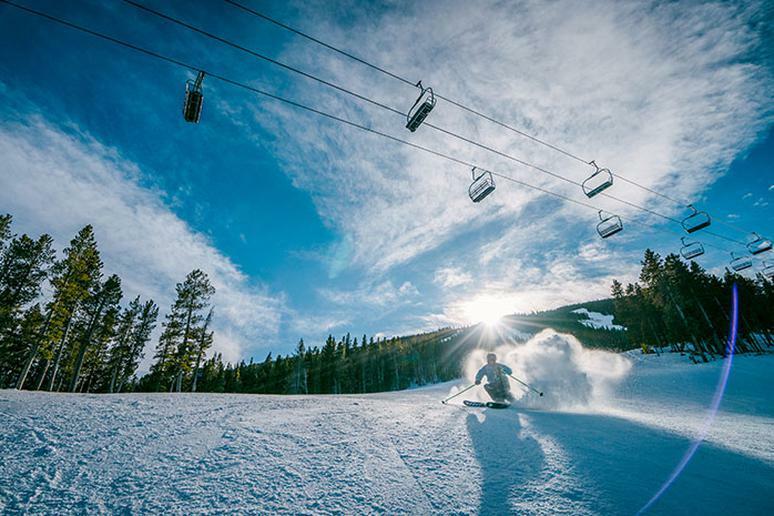 This winter is a particularly great time to visit, since area resorts, such as Kirkwood Mountain Resort, Northstar, and Squaw Valley Alpine Meadows have debuted various snowmaking and environmental improvements in preparation for the season. Lake Tahoe has a multitude of culinary options, beer trails, and après-ski offerings. Squaw Valley Alpine Meadows, located in North Lake Tahoe, hosted the 1960 Winter Olympics and is celebrating the 50th anniversary of the Squaw Valley Aerial Tram on December 18, which provides unparalleled views while transporting visitors up to High Camp. Additionally, as of December 1, 100 percent of the resort’s electricity will be renewable — reducing Squaw Valley Alpine Meadow’s carbon footprint by 49 percent. Along with skiing and snowboarding, the resort offers snow tubing, snowmobile rentals, cross-country skiing, yoga experiences, snowshoeing, dog sledding, après-ski offerings, and more. 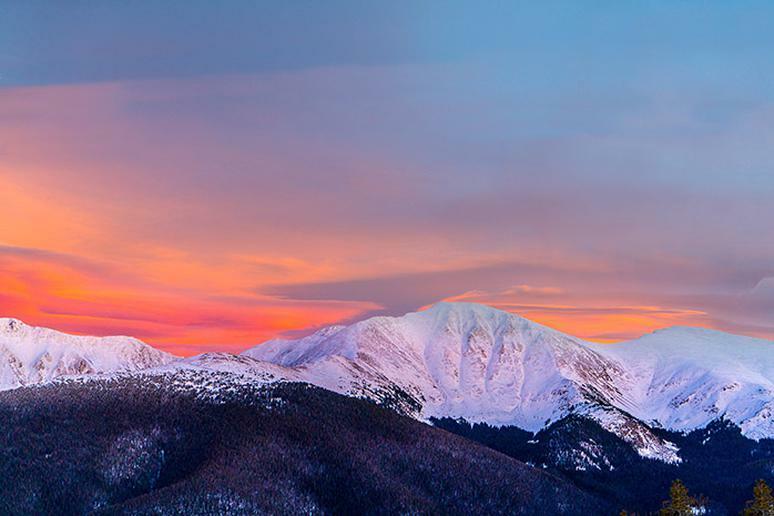 Located 67 miles from downtown Denver, Winter Park Resort features over 3,000 skiable acres of terrain to go along with over 325 inches of annual snowfall, making it one of the premier winter destinations in Colorado. This winter, the resort is investing over $30 million in on-mountain improvements, including a new 10-person gondola, which will greatly reduce the time it takes to get on the mountain. The ski resort is easily accessible via the Winter Park Express train service, the only one of its kind in North America, an 80-minute trip that winds through the mountains along the historic Moffat rail line, which takes passengers from Denver Union Station directly to the slopes of Winter Park, dropping guests just steps from the nearest chairlift. In addition to world-class skiing/snowboarding, there are plenty of other fun winter sports such as snowmobiling, dogsledding, cross-country skiing, snow tubing, snowshoeing, and fatbiking. Board Connecticut's Essex Steam Train, which hosts its wildly popular holiday rides: North Pole Express, a 90-minute nighttime ride in which each coach has a live music performance of “The Night Before Christmas,” sing-a-longs, hot chocolate, and sugar cookies, and Santa Special, a daytime train ride aboard decorated train cars, Santa Claus, Mrs. Claus, reindeer, and other holiday surprises. 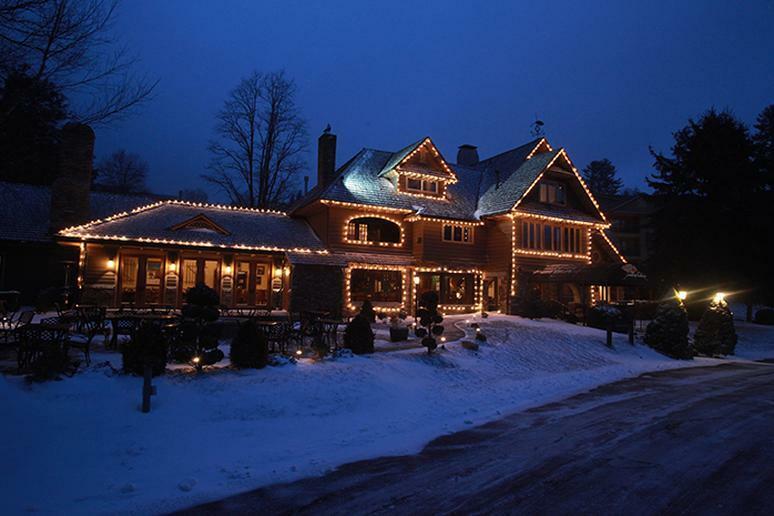 Stay at The Griswold Inn, one of the oldest continuously operated inns in the country. The 33 rooms are furnished with antiques and many have fireplaces. The Inn is also well known for its holiday brunch menu. 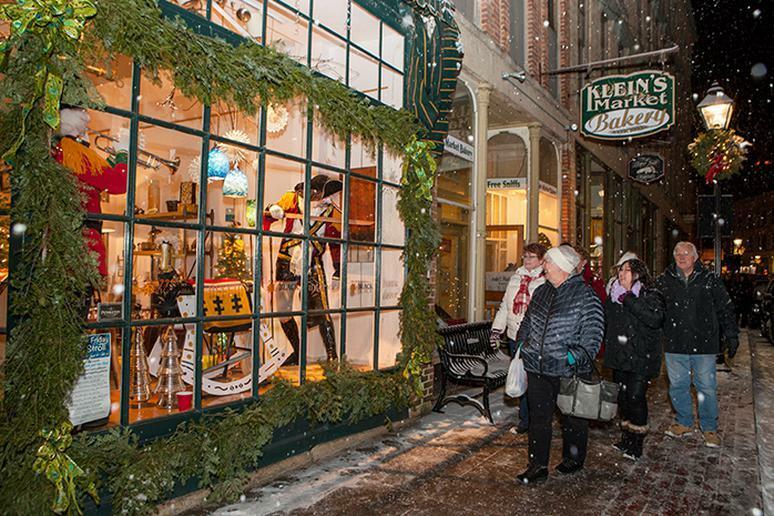 Save time to stroll Main Street for gifts and other local shops/cafes, all decorated for the holidays, or board a Winter Wildlife Eagle Cruise (February and March) on the RiverQuest, which provides ecotours on the lower Connecticut River. All aboard the Santa Claus Express, a 90-minute train ride aboard an antique steam locomotive in Delaware. Santa Claus rides the train, stopping for meet-and-greets and selfies with children of all ages. In addition to photos and memories, children are also give a sweet chocolate treat from Santa. Escape the cold while still enjoying all the holiday cheer in the Florida Keys, which offer a free-spirited holiday season. The 125-mile-long island chain offers events through November and December. From Key Largo to Key West, festive activities include Key West Holiday Fest (November 21 to December 31), which includes lighting of the Harbor Walk of Lights, Holiday Historic Inn Tours and a lighted boat parade to December Conch Tour Train Holiday Lights Tours to New Year’s Eve “Drops” in the Southernmost City, the 26th annual “conch shell drop” at Sloppy Joe's Bar in Key West, the descent of a super-sized red high-heel shoe carrying world-famous drag queen Sushi at the Bourbon St. Pub/New Orleans House in Key West, the lowering of a pirate wench from atop a tall ship’s mast at the Schooner Wharf Bar in Key West, and a Key lime wedge splashing down into a larger-than-life margarita glass at Ocean Key Resort & Spa. 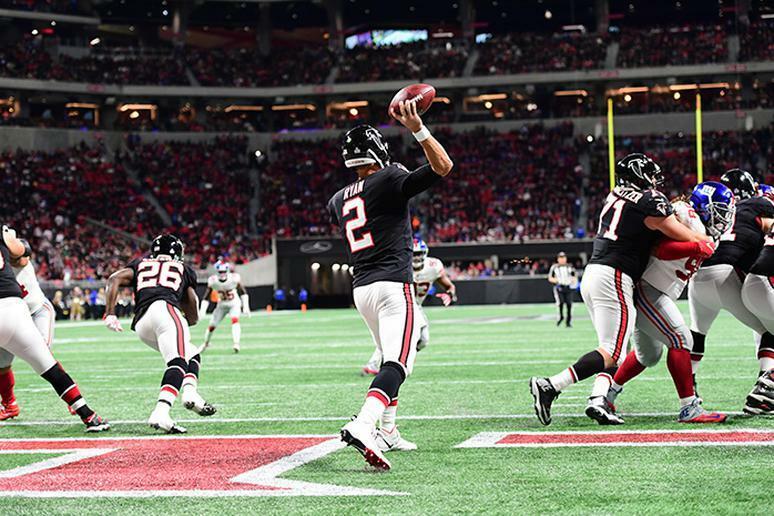 Sports fans are already counting down to the hottest even of winter in Atlanta, Georgia — Super Bowl LIII, which will be played on February 3, 2019 at Mercedes-Benz Stadium. The NFL On Location Experiences offers on the field meet-and-greets with NFL legends, prime seats, and more. 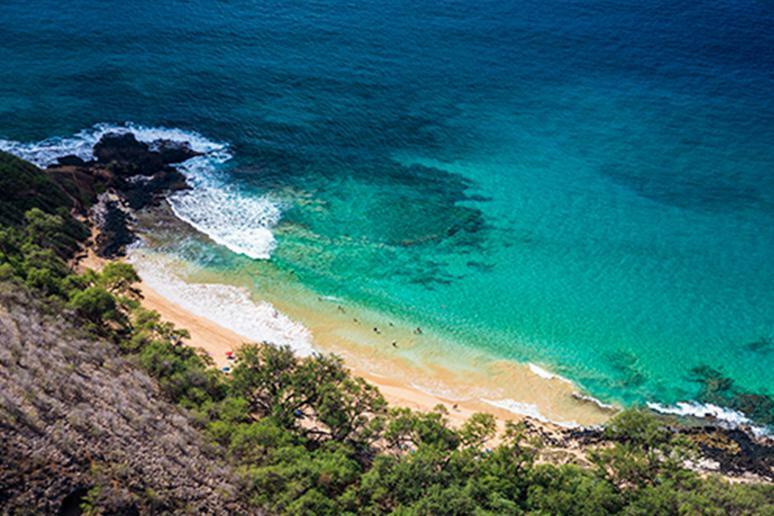 South of Wailea, Hawaii, the 165-acre Makena Beach State Park offers exceptional surfing. With two beaches and a 360-foot-tall dormant volcano, there is plenty of golden sand and surf to explore. 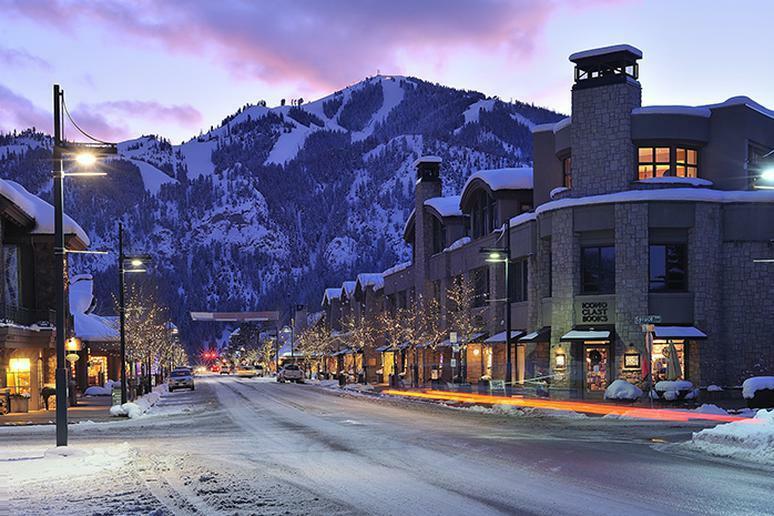 Easily accessible via direct flights from Friedman Memorial Airport in Hailey, Idaho or a three-hour drive from Boise Airport, Ketchum and Sun Valley are winter wonderlands. America’s first destination ski resort, Sun Valley Resort, boasts championship-level skiing, snowboarding, and terrain parks on Bald Mountain and Dollar Mountain; ice skating on the Resort’s outdoor rink; winter scenic sleigh rides and sleigh ride dinners to Trail Creek Cabin; and fat-tire biking, snowshoeing and Nordic skiing. In the winter, the city streets and Resort Village are lit with twinkling lights, and the Sun Valley Resort, which is adding 380 acres of new terrain and updating an older lift to a high-speed lift, also has snow sculptures, giving the area a festive, winter wonderland vibe. The Ketchum/Sun Valley area is also part of the recently designated Central Idaho Dark Sky Reserve, the country’s only Gold-Tier International Dark Sky Reserve. It’s a one-mile walk between Sun Valley Resort and Ketchum, where author Ernest Hemingway lived during his later years and died (he’s buried at Ketchum Cemetery), but there is a complimentary Town Bus service between Ketchum and the Sun Valley Resort Village. The quaint town of Galena looks much like it did during the time of the Civil War, although now its historic red brick buildings are home to charming boutiques, art galleries, and restaurants. Galena, Illinois is also known for its cozy lodgings, with quaint bed and breakfasts dotting the picturesque hillsides surrounding the town. A trio of our favorite things to do in winter includes booking a getaway at The Inn at Irish Hollow, which decks the halls of each room and serves a holiday menu with ingredients grown in their own organic gardens. Staying over the holidays? Ship your gifts in advance of your stay and the staff will wrap them for you! Time your visit for the Night of Luminaria on December 8. Watch more than 30 windows come alive with holiday-inspired animation along Galena’s historic Main Street. Lace up your ice skates and head to Nordic Center at Eagle Ridge Resort where ice skaters can skate around the 1.5-acre natural pond, sled down the 18th hole of the south golf course, and snowshoe or cross-country ski on 7 miles of groomed trails for a winter day to remember. At Pokagon State Park in Steuben County, Indiana there is a one-of-a kind toboggan run! Up to four people can ride the toboggan, which is launched from a 30-foot-high tower. Sledders streak a quarter of a mile downhill at more than 30 mph. Try to beat the record of 42 mph! One shortcut to getting through the line faster is to secure your toboggan in advance with an online rental payment. 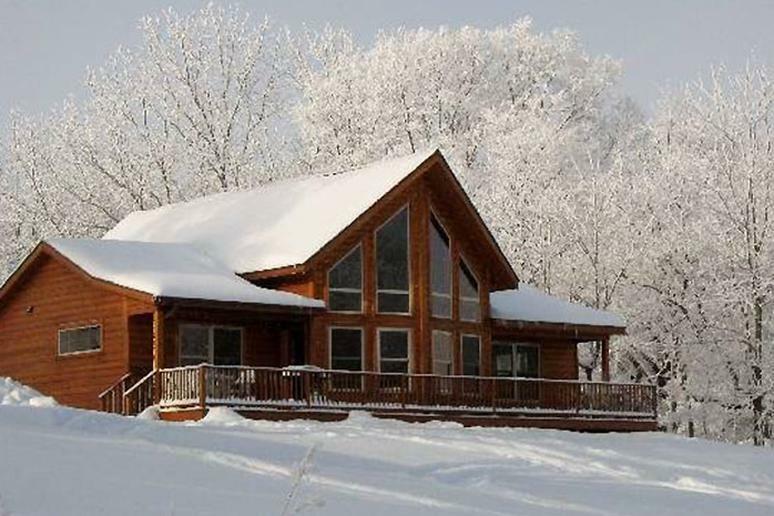 Red Cedar Lodge provides a quiet getaway in Iowa with unforgettable views and rooms. Three cabins comfortably sleep up to eight people. There’s a hot tub on site and each cabin has a deck and grill. Guests can walk right out their doors to indulge in nature watching, hiking, and winter sports. In nearby Charles City, visitors can shop the charming Main Street, take in a movie at the historic Charles Theatre (one of just two Art Deco theaters still operational in Iowa), or view the impressive Mooney Art Collection on display in the library, which includes works by Rembrandt, Gauguin, Dali and Picasso. Known as “Little Sweden USA,” the city of Lindsborg is celebrating its 150th anniversary in 2019. One of the best parts of winter in Kansas is the Saint Lucia Festival. Commonly celebrated in Sweden on December 13, the Saint Lucia Festival is rooted in the story of white-robed Lucia, who arrived in a hard-struck village with food. The festival in Lindsborg recreates the legend on the second Saturday in December every year. 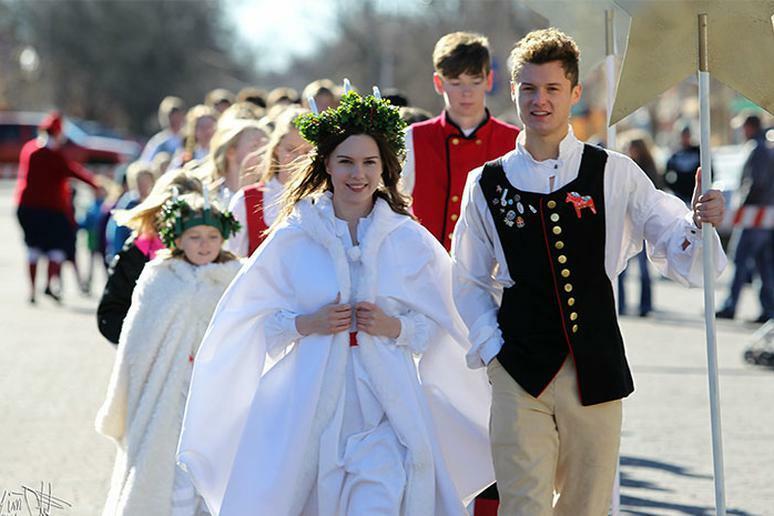 Amid a day of Swedish folk dancing, live music and children’s crafts, Lindsborg offers the chance to spy Lucia as she might have been seen those many years ago. At 11 a.m., a young woman clothed as Saint Lucia, and her stjärngosse (star boys) lead a procession to Bethany Lutheran Church for the fourth-grade performance of traditional songs, sung in both Swedish and English. Later in the day, the adult Folkdanslag group joins for more dancing, and gingersnaps and coffee are served. The crowning moment is the coronation of the high school’s Saint Lucia and the singing of traditional Saint Lucia songs. The chilly temps have no affect on the beauty of Mammoth Cave National Park in Kentucky. Its underground tours are unaffected by the weather. 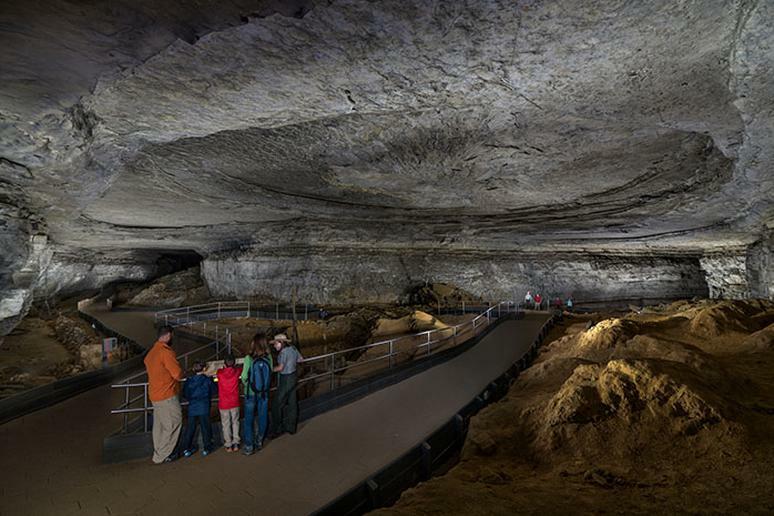 There are more than 400 miles of passageways mapped and explored; Mammoth Cave is the longest cave system in the world. Tours are available for visitors of all levels of physical ability from a handicap-accessible tour that became available in the fall of 2016 all the way up to extreme multi-hour spelunking expeditions. Above ground, there are pedestrian, horseback, and biking trails to enjoy at the park, a UNESCO World Heritage Site that is considered the second-oldest tourist attraction in the U.S. The park also contains the historic ruins of the railroad line used by the Mammoth Cave Railroad Company to bring tourists to Mammoth Cave between 1886 and 1929. Over the next three years, the park will be receiving over $500,000 in updates. Located in north-central Louisiana an hour south of Shreveport, Natchitoches (pronounced Nack-a-tish) is the oldest permanent settlement in the Louisiana Purchase Territory. It’s also where “Steel Magnolias” was filmed. The National Historic Landmark District includes French Creole townhouses, the Minor Basilica with its stained-glass windows, and the 19th-century Kaffie-Frederick General Mercantile, the city’s oldest general store. The meandering Cane River runs south to plantations within the Cane River Creole National Historical Park. These include the 18th-century Oakland Plantation. This picturesque historic community was the backdrop to a one-day Christmas festival back in 1927. Now, the celebration has evolved into a two-month-long celebration of the Christmas season. In 2013, Yahoo.com ranked the Natchitoches Christmas Festival of Lights the third best holiday light show behind the Rockefeller Center and Disney World in the nation. Downtown attractions include fireworks every Saturday night, Kid’s Fest, carriage tours through the historic district, food vendors along the downtown riverbank open nightly for festive treats, and community organizations have Christmas programs scheduled throughout the season. Santa Claus and his helpers have a station set up along the riverfront. 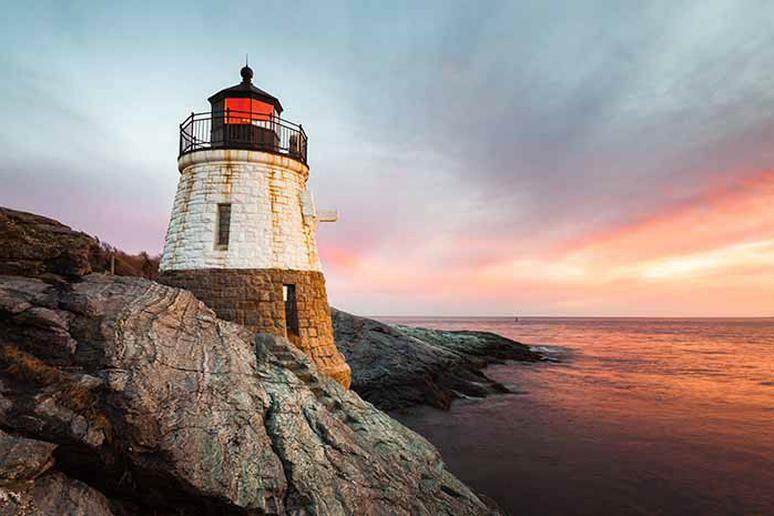 Located in the western mountains of Maine, Bethel offers the perfect mix of winter activities. This is, after all, a community that broke their own world record with the World’s Tallest Snowman (a 122-foot snow “woman”). There is extraordinary alpine skiing at Sunday River and Nordic skiing, snowshoeing, and a great après-ski scene in Bethel. There is also a walkable downtown that is worth exploring. Make sure to get out on the Bethel Village Trails, a trails system that is a collaborative project between Mahoosuc Pathways, Bethel Outing Club, and The Bethel Inn Resort that is ideal for Nordic skiing, snowshoeing, and walking. 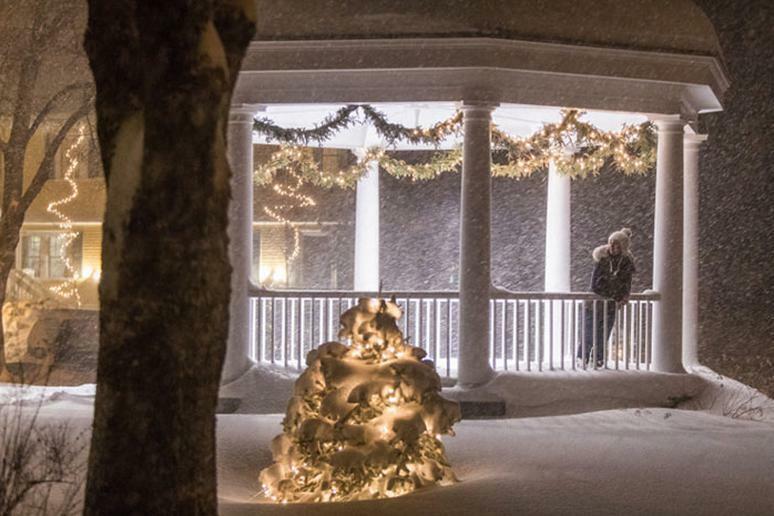 Without a doubt, Garrett County, Maryland is the place to visit in the winter. Garrett County is home to nine state parks, state forests and state natural resources management areas. Cross-country skiing is popular at Herrington Manor State Park and ice fishing is a popular pastime on Deep Creek Lake. Visitors can take horse-drawn carriage or sleigh rides. Wisp Resort provides slope-side lodging, dining and evening entertainment, downhill skiing trails, a terrain park for snowboarding, several tubing lanes, three different levels of zip lines and canopy tours (weekends only during the winter), and a mountain coaster (a two-person roller coaster). 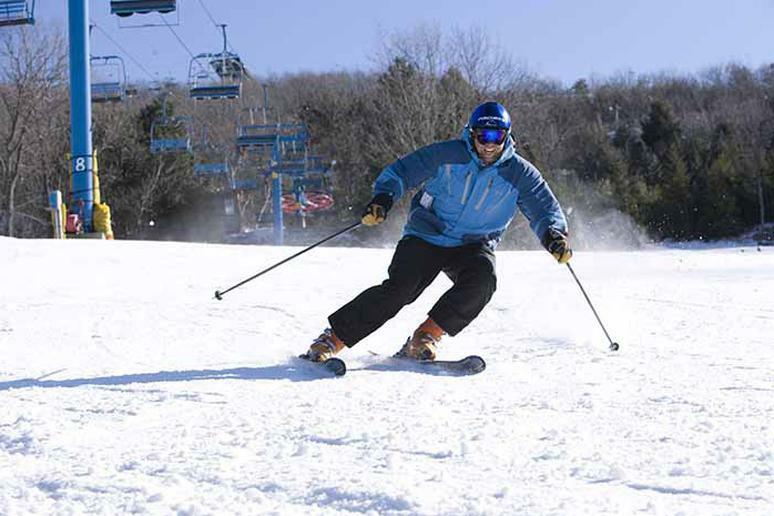 Located in Central Massachusetts, Wachusett Mountain Ski Area features the highest mountain in Massachusetts east of the Connecticut River. With a summit elevation of 2,006 feet, skiers enjoy a vertical 1,000-foot drop. There are 26 trails with an uphill capacity of 9,200 skiers per hour. The slopes are groomed twice a day, ensuring each run is ideal. Located in Michigan’s rugged Upper Peninsula, Marquette is the largest city in the Upper Peninsula, as well as one of the coldest cities in the country. Marquette is located near Lake Superior, the largest body of fresh water on the planet, containing 10 percent of the world’s fresh surface water. The area also receives over 200 inches of annual snowfall, making it perfect for winter fun. Pack a wetsuit and board for winter surfing. Surf season on Lake Superior runs from October to March, but January to March is the best time to catch the biggest surf-able waves (10 – 12 feet) on the Great Lakes. Winter ice climbing entails climbing on a frozen waterfall, ranging from 20 to 210 feet tall. The Grotto in Marquette is a popular place to climb, but if you are traveling from afar, nearby Munising has the best ice climbing. 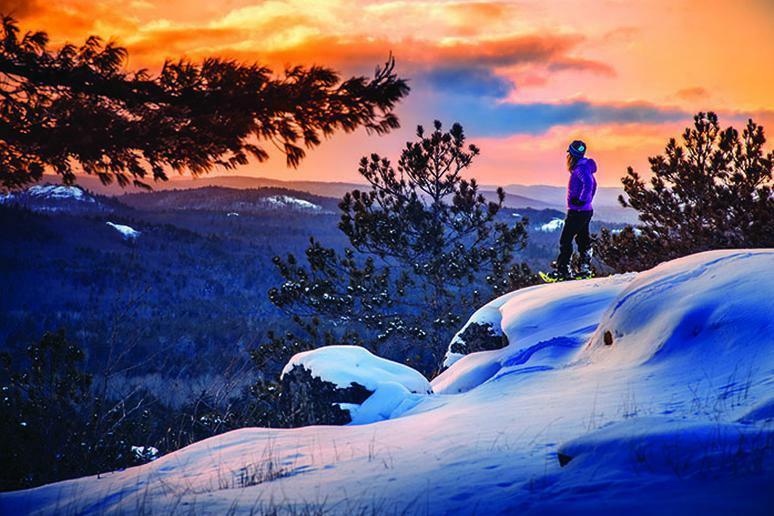 Marquette Mountain offers downhill skiing with a view of the lake, while the Noquemanon Trail Network has miles of trails for cross-country skiers and fat tire biking. The area also has plenty of trails for snowshoeing and snowmobiling. The Eben Ice Caves are close by, where visitors can hike to the frozen caves, formed by snowmelt freezing over the edge of small cliffs. First-time visitors should take a quick 20-minute hike to the top of Sugarloaf Mountain, which overlooks Lake Superior and Marquette. Afterward, head into town for local brews at Barrel + Beam, with barrel-aged ales, or Blackrocks Brewery, for craft beers and live music. In far northwest Minnesota along the Canadian border, Lake of the Woods is one of the top ice fishing destinations in the world. The northern half of Lake of the Woods is home to the Northwest Angle, the northernmost point in the U.S., a tiny slice of America cut off from land access to the rest of the country. 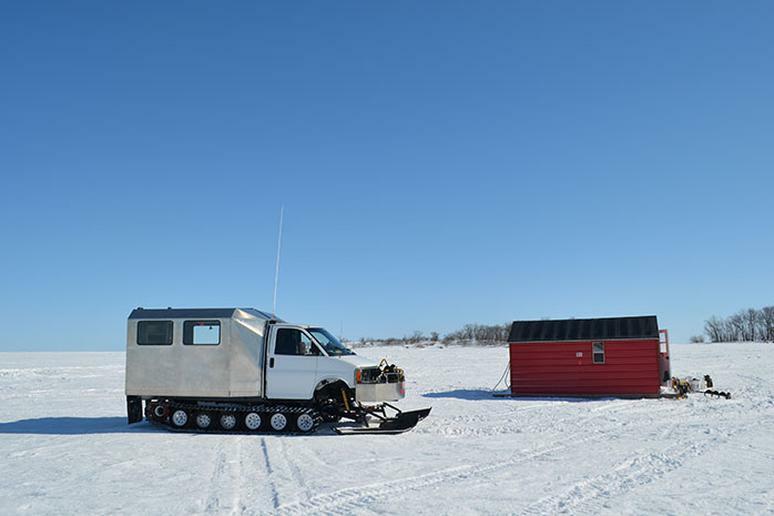 In the winter months, Lake of the Woods hosts 1,500 and 3,000 fish houses during the season. The fish in Lake of the Woods are incredibly active all year round. Even in the heart of winter, many anglers have no trouble landing their daily limit of walleye, saugers, northern pike or eelpout, plus the occasional jumbo perch or tullibee. Zippel Bay Resort in Williams operates its own Igloo Bar, with beer, wine, mixed drinks, a simple menu, and the option of jigging for walleye from your bar stool. Mississippi Children’s Museum in Jackson, Mississippi has been transformed into the North Pole this winter (the exhibit is open now through January 6). The family-friend Journey to the North Pole exhibit features snowy skies, twinkling starry lights, and festive cheer. There are climb-on train cars, a 45-foot Snowflake Slide, and Santa’s Stable, where visitors can ride a secret sleigh with reindeer. Children can also make a life-size gingerbread house. Don’t forget to take pictures with Santa. Just south of Branson, Big Cedar Lodge in Ridgedale, Missouri, is a wilderness resort that offers expansive views of the Ozark landscape and nearby Table Rock Lake. Developed by sportsman and conservationist Johnny Morris — founder of Bass Pro Shops, Big Cedar Lodge has a variety of lodging options, including rooms in the grand lodge and cozy cabins with fireplaces perfect for cold winter days. Nearby, Dogwood Canyon, a 10,000-acre nature park offers hiking trails, streams, a mill and unique bridges and is worth a visit. The park hosts Eagle Days on December 26 and January 27-28 where visitors can learn more about eagles and travel to spotting stations to watch for bald eagles in the wild. 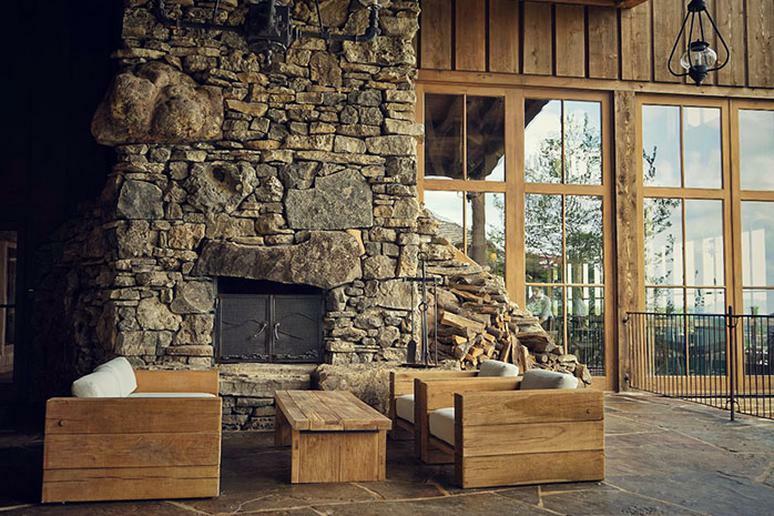 The Cedar Creek Spa at Big Cedar is an 18,000-square-foot spa complete with hand-hewn timber ceilings, natural stone floors, handcrafted stained-glass accents, and antique-style chandeliers. A grand staircase leads to 11 luxuriously appointed spa rooms; each room has its own cozy fireplace. A towering fireplace also serves as a dramatic backdrop for the saunas, hot spas, and steam rooms. Big Cedar’s 50,000-square-foot Fun Mountain offers a wide array of family-friendly activities, from underwater themed bowling and laser tag to bumper cars and a climbing wall. The resort promotes ecologically sound land management and conservation of natural resources. Nestled in Montana’s majestic Beartooth Mountains and surrounded by Custer Gallatin National Forrest, Red Lodge is the perfect place to visit during winter thanks to its western hospitality and affordability as a ski vacation. The quaint, historic, mountain town has access to Red Lodge Mountain Ski Resort, and just 2 miles west is Red Lodge Nordic Center, which offers miles of groomed cross country ski trails for all skill sets. Arbor Day Farm, a national historic landmark located in Nebraska and the birthplace of Arbor Day, and Lied Lodge & Conference Center, with 140 nature-inspired rooms, 14,000 square feet of event space, and 260 wooded acres to explore, host a variety of winter-themed activities, including brunch with Santa, a holiday trolley tour of Christmas lights, Christmas at the Arbor Lodge Mansion, year-end New Year’s and winter stay packages, and Fireside Wine & Music to relax and stay warm in the winter. Not only is it a beautiful place covered in holiday lights, but there is plenty to do whether you want to cozy up to a fire, head to the spa, dine at Timber Dining Room for chef-inspired dishes or participate in fun activities outdoors. 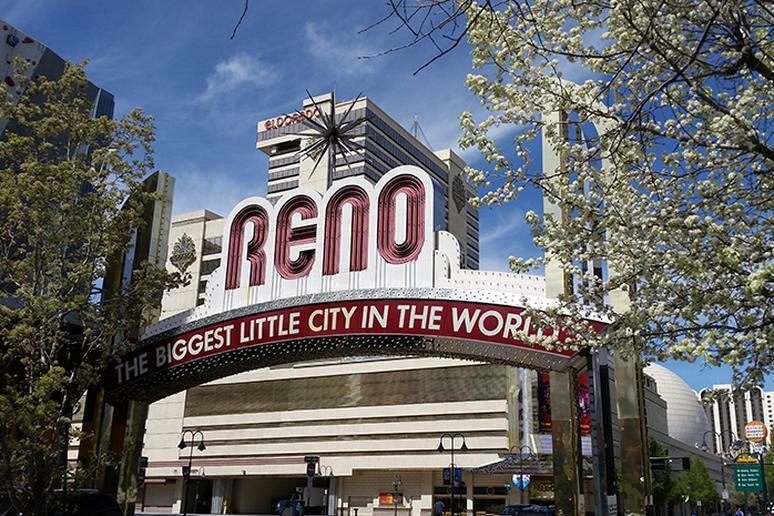 Easily accessible via Reno-Tahoe International Airport and Interstate 80, Reno is a fun Western town with a vibrant arts community and a revitalizing downtown. Founded in 1868, Reno gained a name for itself in the early 20th century as a place to get a divorce and to gamble. Today, the Nevada city is known for its vibrant arts community, burgeoning tech industry, revitalized downtown, and proximity to Lake Tahoe and the Sierra Nevada. Winter is an ideal time to enjoy skiing and other winter activities, such as sledding, snowshoeing, and cross-country skiing. Mount Rose-Ski Tahoe is 45 minutes from downtown; Diamond Peak Ski Resort is about an hour’s drive. 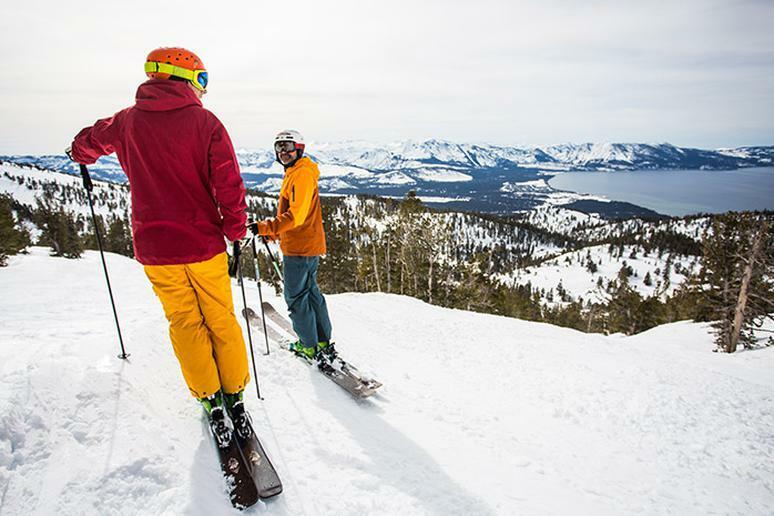 Heavenly Mountain Ski Resort, which straddles the Nevada-California border, also is nearby. Check out the downtown Reno dining scene, including chef Mark Estee’s Liberty Food and Wine Exchange and chef Colin Smith’s Roundabout Bistro. Reno, like many cities, has a burgeoning brewery scene, but the brew houses in the “Biggest Little City in the World” also offer great dining from the Vegan Involtini (almond milk ricotta wrapped in sweet potato, vegetable sautée, eggplant and roasted tomato purée, frisée, and Peppadew vinaigrette) at The Depot Craft Brewery Distillery to the duck confit cassoulet at Brasserie Saint James. Take a ride on the Mt. Washington SnowCoach, a unique winter tour giving visitors an opportunity to experience the extreme winter weather on Mt. Washington, the highest peak in the Northeast. Mt. Washington is known for having some of the most extreme weather in the world; it once held the world record for wind — its weather station recorded a 231-mile-per-hour wind gust on April 12, 1934. 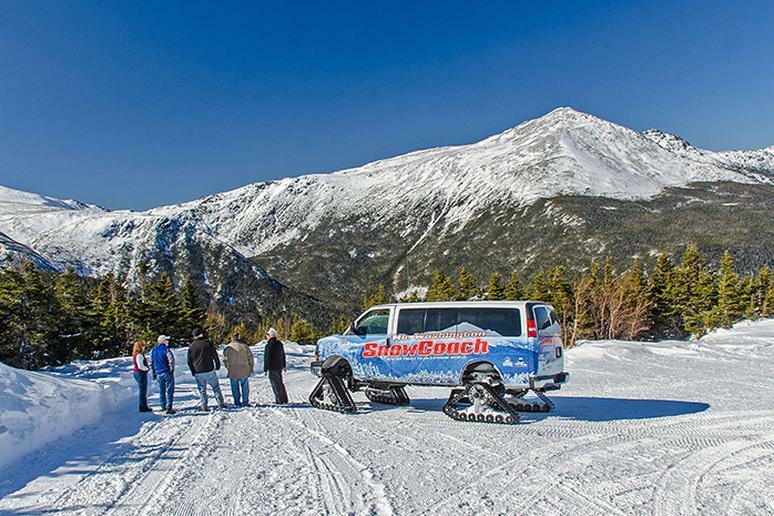 The SnowCoach is located at the Mount Washington Auto Road, in Gorham, New Hampshire. The Coach is a van that is transformed into a heavy-duty tread-driven winter vehicle that transports visitors up 4,200 feet to tree line and a sub-arctic world that is typically only accessible to mountaineers. An incredible time to experience this winter tour is during a sunrise. SnowCoach tours are offered on most days from mid-December through March, and passengers can leave the coach for photo and video opportunities. 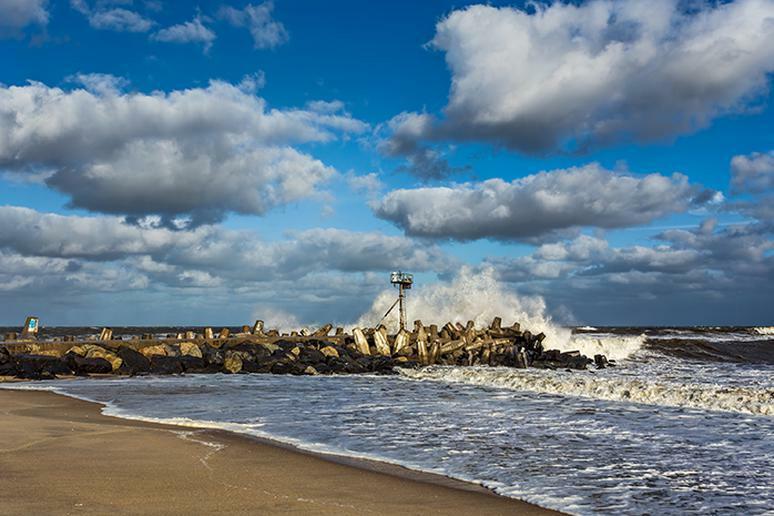 The Central Jersey shore provides exceptional year-round fishing, and Manasquan Inlet in Point Pleasant Beach, New Jersey, is a significant location for winter birding. The open waters near the mouth of the Manasquan River are an ideal spot to spy wintering waterfowl that come here for refuge during the winter months. 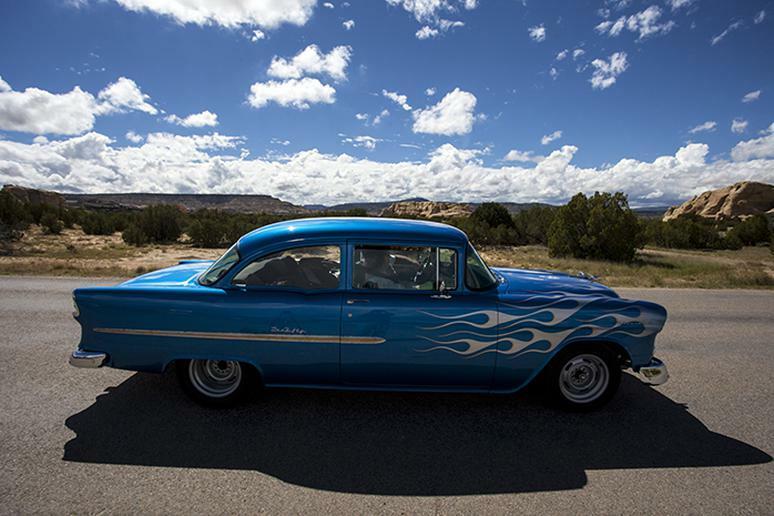 Get your kicks on Route 66 by starting out in New Mexico. The 2,451-mile “Mother Road” begins in Chicago and ends in Los Angeles after passing through Illinois, Missouri, Kansas, Oklahoma, Texas, New Mexico, Arizona, and California. Stop at Pecos National Historical Park, a gateway to the plains that is populated with Pueblo ruins and centuries-old Franciscan missions. The Catskills provide a multitude of getaway options. Three hours from New York City; the Great Western Catskills of Delaware County, New York, is an unspoiled respite with bucolic farmland surrounded by stunning mountains and gorgeous views. Quaint villages full of shops are treasure troves for discovering handmade products like ceramic lamps from Stone and Sawyer and gorgeous candles from Greetree Home. Winter is a fantastic time to visit thanks to two ski centers: Belleayre Ski Mountain, which abuts the Delaware County border, and Plattekill in Roxbury. 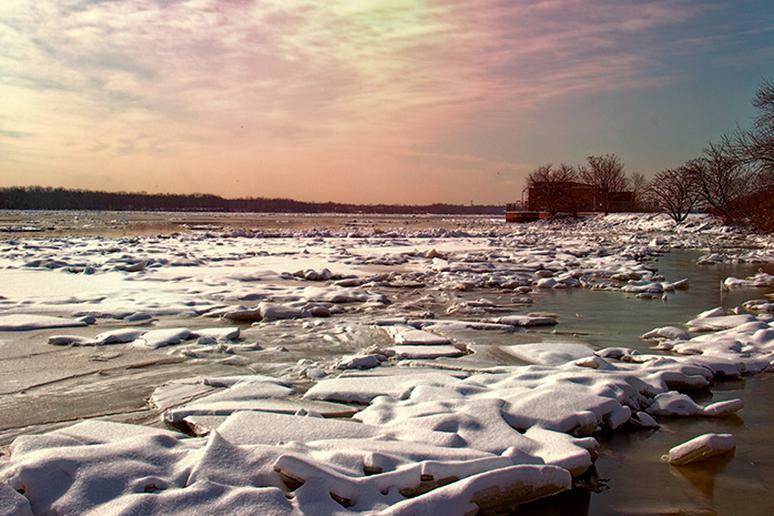 Don’t miss the Ice Harvest Festival on February 2 at Hanford Mills Museum in East Meredith. Located on the banks of the Delaware River, the Sullivan Catskills are also worth consideration. Two hours by car from Manhattan, the Sullivan Catskills offer the opportunity to connect with nature. The area is home to design-friendly inns, farm-to-table restaurants, local boutiques, and a range of outdoor activities, including hiking, snowshoeing, and cross-country skiing. 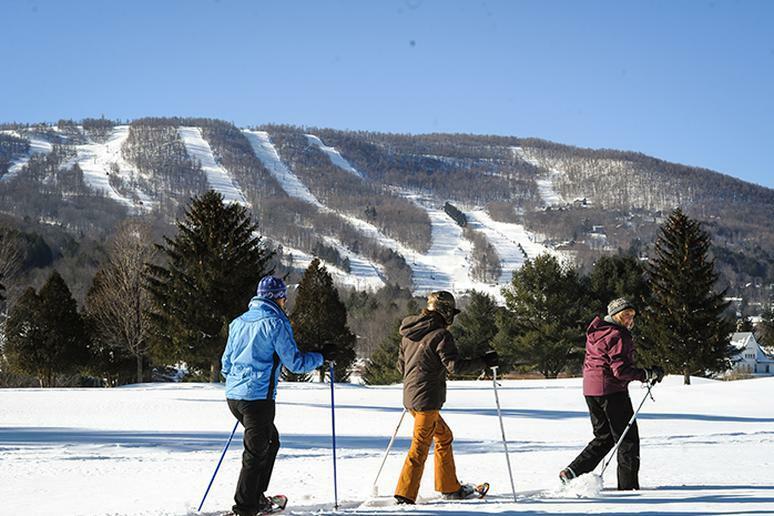 Yet another Catskills option is Windham Mountain in Windham, N.Y. Take the family to Windham’s Adventure Park for ice-skating, kids’ snowmobiling, cross-country skiing, and snowshoeing. Stay at Winwood Inn or rent one of Windham Mountain’s slopeside private vacation rentals and enjoy ski-in and ski-out lodging. The mountain’s on-site Alpine Spa provides the ideal place to relax with a luxurious treatment or sports massage after a day on the slopes. In the town of Windham, art galleries, an amazing French bakery and restaurants await. Nestled in the picturesque Appalachian Mountains of North Carolina, Blowing Rock is a winter wonderland, with snowy views, warm places offering cozy respite, and great winter recreation. The town is named for the Blowing Rock, an outcropping of stone studded with crystals that hangs over a deep valley. The rock is famous for the constant, strong upward draught that comes out of the valley below the rock. This wind is so steady that in the winter, snow will fall upwards around the rock. A local legend states that a despondent Indian brave, torn between his love for an Indian maiden and his manly responsibilities, threw himself to certain death from the precipice. The maiden prayed at the outcropping until the brave was blown back into her arms. But there is more to Blowing Rock than just the legend. On a clear day, visitors can peer into the distance from an observation tower and see Grandfather Mountain, as well as Hawksbill and Table Rock. Nearby Appalachian Ski Mountain offers nine slopes and three terrain parks, and the French Swiss Ski College offers top-quality instruction. Spend some time at the outdoor ice skating rink, or head over to Hawksnest for snowtubing and zip-lining if that is more your style. The town of Blowing Rock has nearly two dozen warm and romantic dinner options; date night favorites include The Best Cellar, Twigs, The Gamekeeper, Restaurant at Gideon Ridge, and Rowland’s Restaurant. Fargo’s “North of Normal” slogan is a perfect fit for this winter wonderland. 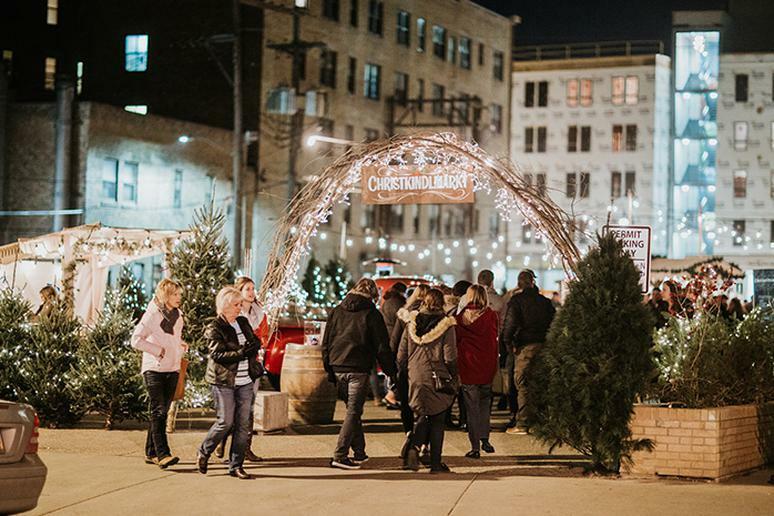 It all starts with the Christkindlmarkt by Folkways that include four days of festive cheer in the Outdoor Winter Wonderland and Gift Market with food, live musical performances, art demonstrations, mulled wine, holiday treats, and children’s activities. Then, start off 2019 by attending Frostival, a two-day event dedicated to embracing winter. Visitors enjoy old-fashioned freezing family fun with hot chocolate, s’mores, sleigh rides and cardboard sledding, and more off-the-wall events include a nearly-naked skamper down Broadway and a stylish facial hair competition. The largest city in North Dakota, Fargo has more than 200 local eateries, including eight current breweries and a few more on the way, including the Brewhalla, Junkyard Brewing, and Proof. If North Dakota is the last state on your bucket list, be sure to stop in at the Fargo-Moorhead Convention and Visitors Bureau and join the official “Best for Last” club created especially for people who save North Dakota for last. If you want a small-town feel, don’t miss Cambridge in eastern Ohio. 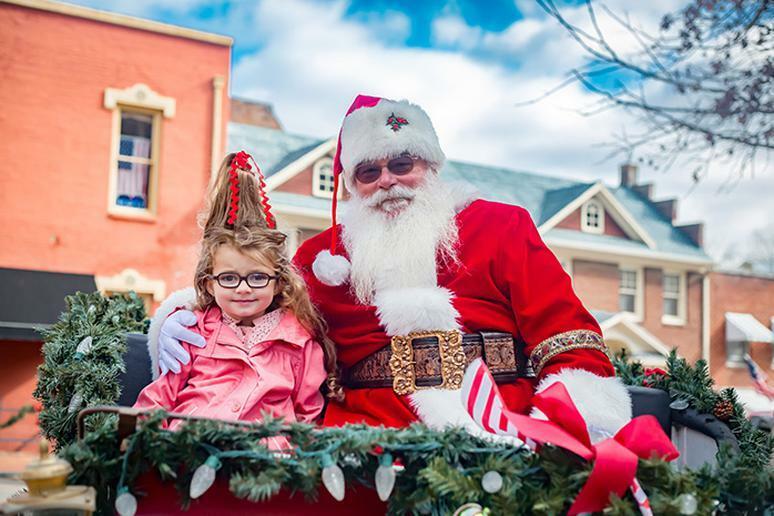 The town rolls out the holiday red carpet each year starting in November with the one-of-a-kind Dickens Victorian Village, a collection of more than 180 life-size figures depicting scenes from Dickens-era holiday scenes, from Tiny Tim to Bob Cratchit to Father Christmas. Peruse the scenes, situated throughout the quaint downtown, and pop into some of the eateries and shops along the way. Kennedy’s Bakery, a staple in the area since 1925, is a must-stop for holiday cookies, pastries, and more. 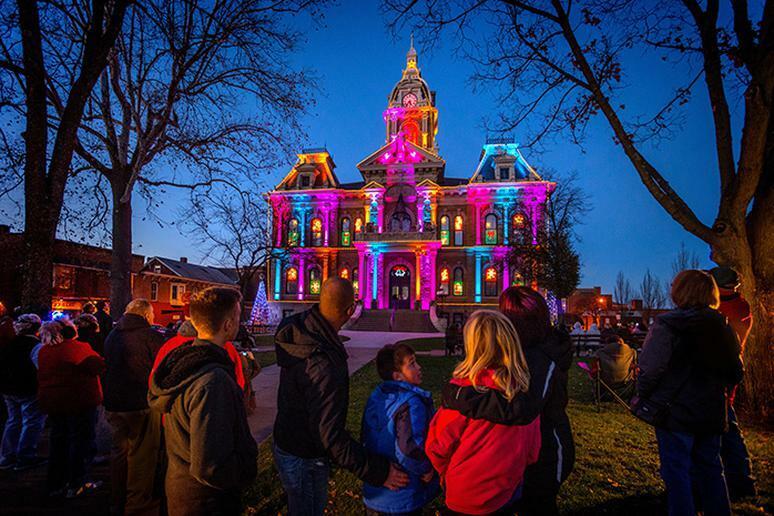 Cap off the night with a viewing of the Courthouse Light Show right in the middle of downtown. Oklahoma’s state capital has a rugged Western past, and a downtown urban renaissance has created a modern metropolis that is still rich in cowboy culture. Oklahoma City’s annual Downtown in December is a series of holiday events and attractions like outdoor ice skating, a tree lighting festival, Saturday afternoon visits with Santa, holiday fun-runs, free water taxi rides, performing arts, and shopping. Festivities begin in early November and extend through January. 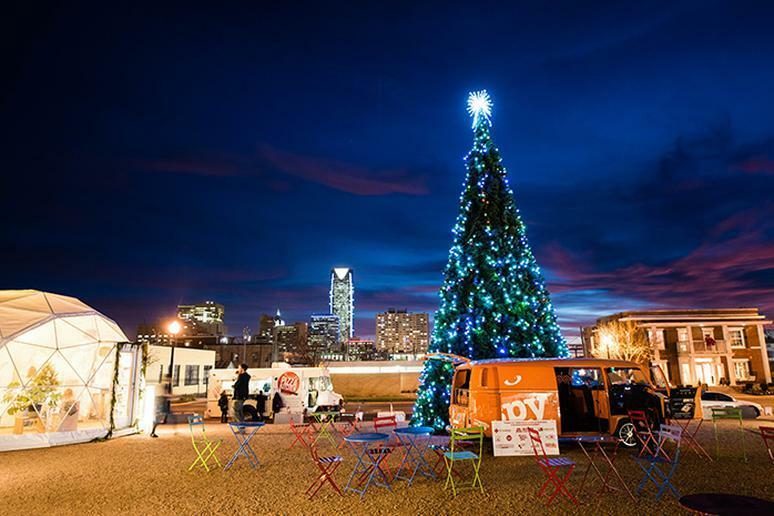 Stay downtown or Bricktown in Oklahoma City’s entertainment District to experience many of the Downtown in December events. A 6-mile modern streetcar that stops at many of the Downtown in December events will open in mid-December. A two-hour drive from Portland, Pacific City on the Oregon Coast is the perfect winter retreat. Watch winter storms brewing along the 363 miles of public coastline from the comfort of a cozy coastal lodge. On the drive from Portland, pass by the famous Tillamook Creamery (a brand-new visitor center opened in July). 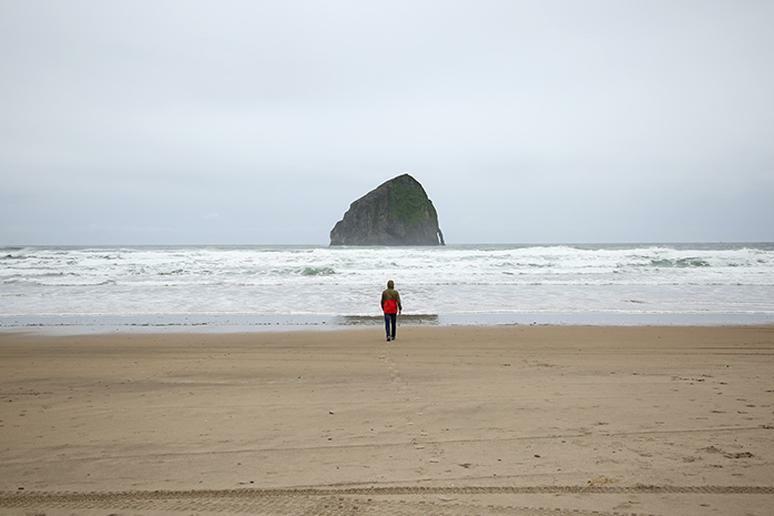 Pacific City’s most iconic feature is the haystack rock that sits about a mile off shore. From the beach, you can also access Cape Kiwanda (part of the Three Capes Scenic Route, along with Cape Meares and Cape Lookout). Kiwanda is the smallest of the three, but it is one of the best places to experience spectacular wave action. Pacific City is also the home of the Pacific Dory Fleet. Just south of Cape Kiwanda is the dory boat launching area, one of the only spots on the coast where you can watch the boats drive ashore. While in Pacific City, stay in the brand-new Headlands Coastal Lodge and Spa, one of the only luxury lodging properties on the coast. Each of the hotel’s 33 rooms has an ocean view. Headlands offers guests an array of amenities, including an “adventure coach” that can help guests curate an Oregon-style experience from surf lessons to crabbing or climbing the sand dunes at Cape Kiwanda. In Pennsylvania’s Laurel Highlands, Nemacolin Woodlands Resort in Farmington offers luxurious accommodations. Ski and snowboard at Mystic Mountain or opt for snowtubing or dogsledding. After a day of outdoor adventure, relax at the Woodlands Spa. Make time to tour the nearby Frank Lloyd Wright houses, including Fallingwater. Another place to explore is the Lodge at Glendorn in Bradford in northwestern Pennsylvania. From private cabins with cozy outdoor fire pits to the all-redwood Main Lodge’s convenient rooms and suites, there’s something for everyone in this luxuriously private Pennsylvania getaway. During your stay, hike and bike through 1,500 acres of a vast trail system, take a romantic horseback ride just 40 minutes from the resort, or indulge in a relaxing yoga session to truly unwind. 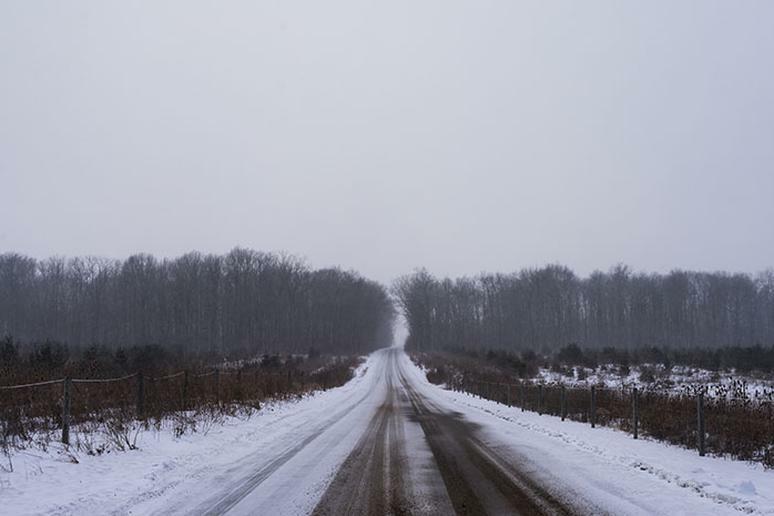 Adjacent to the Allegheny National Forest, there is also cross country skiing and ice fishing plus the option to go snowmobiling in Allegheny National Forest. 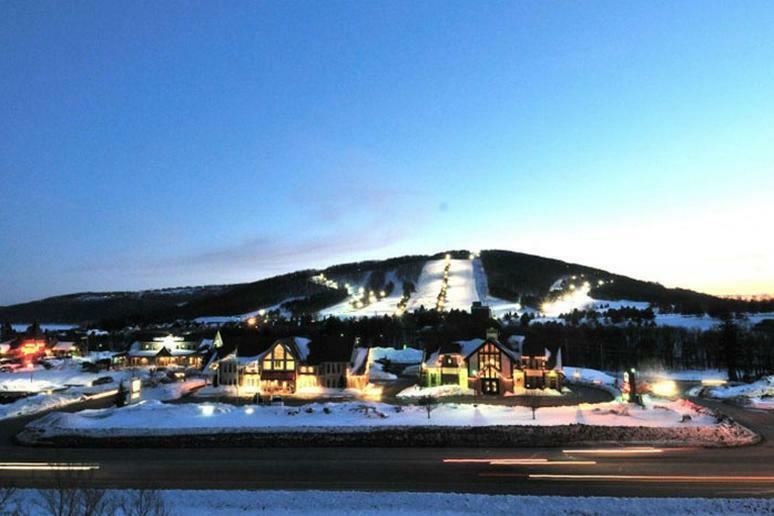 More exceptional skiing and snowboarding is on offer at Camelback Mountain Resort in Tannersville in the Pocono Mountains, which also boasts an indoor waterpark. The resort has the largest snowtubing park in the U.S. and also offers galactic snowtubing. The resort has opened three new restaurants in this year, including Graffiti Pizza, Kartrite Summit House, and Berrelli’s Italian Kitchen. Touted as “New England’s Largest Winter Extravaganza,” the annual Newport Winter Festival in Rhode Island is a 10-day event from February 15 to February 24 that features more than 150 events, including a chili cook-off, Mac & Cheese Smackdown, “princess party” and concerts. With an extensive collection of decor and a long list of free holiday events, the small upstate town of Greenwood is the perfect place in South Carolina to bring the entire family. The holiday festivities kick off with holiday lights in mid-November that remain on display through the holidays. The oak trees on Main Street are covered in 100,000 classic, bright white lights and large, twinkling stars that adorn the trees on beautiful Maxwell Avenue. Life-sized ornaments like teddy bears and toy soldiers are placed throughout the town square in the Uptown district, and a number of illuminated holiday displays are seen on every corner. The Connie Maxwell Children’s Home, a place for child care, counseling and family service programs, adorned its campus with stunning holiday décor and hosts the annual Connie Maxwell Christmas, an event that includes a live nativity scene, carriage rides, and a petting zoo from December 6 to 8. 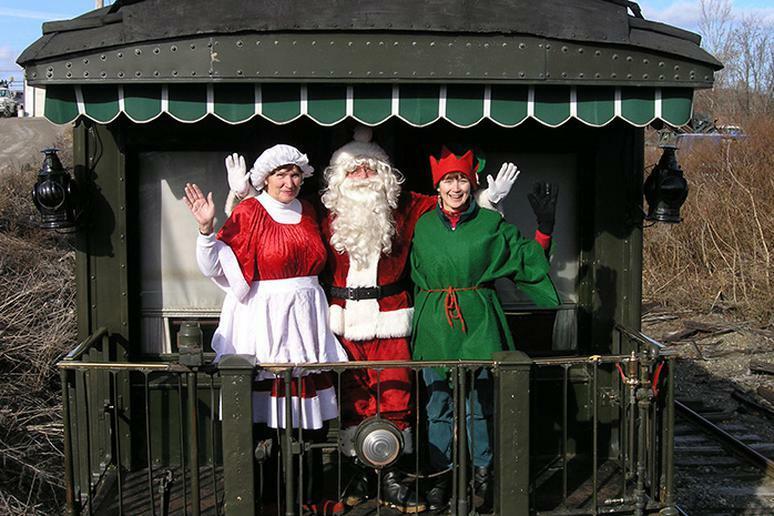 There is also a Santa on Main weekend (November 30 to December 1) when arts and crafts vendors line the streets for the Christmas Market and the Railroad Historical Center hosts the North Pole Express. There is also the Christmas Cookie Crawl and a Tree Lighting Ceremony. The trails of the northern Black Hills in the South Dakota town of Spearfish are perfectly groomed for fat biking. Don’t miss the 28 Below Fatbike Race in mid-March, a fast-paced, grueling 50-kilometer race along a lolly-pop loop with 2,800 feet of climbing. Walking through the historic district and brick-lined streets of Jonesborough is like taking a step back in time. Tennessee’s oldest town and the “Storytelling Capital of the World,” Jonesborough is home to historic inns rich with stories from the past; the first craft beer in Northeast Tennessee; one of the youngest distillers’ in Tennessee; handcrafted smooth and creamy praline recipes; and historic tours. 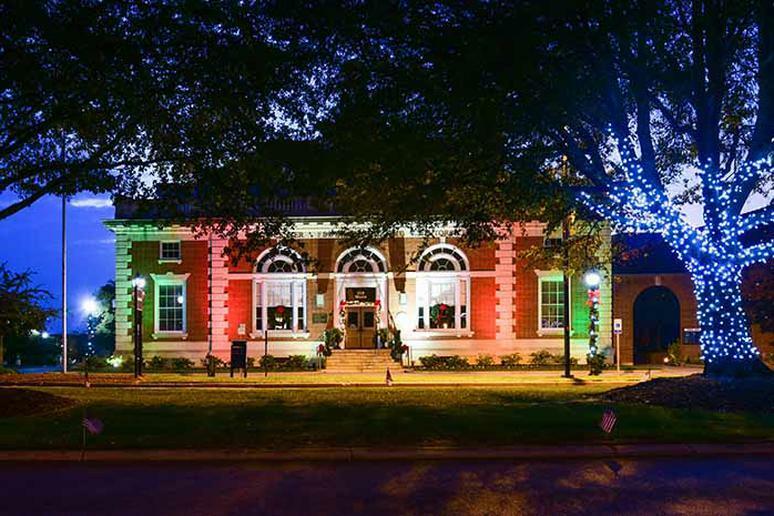 Jonesborough kicks off the Christmas season on November 24 with the annual Lighting of the Tree beside the downtown courthouse, where there is storytelling and the community sings holiday carols. Each Saturday of the Christmas season features free activities for the whole family and a different theme each weekend: Whoville Christmas on November 24 explores the whimsical world of Dr. Seuss; Doggone Christmas on December 1 features activities for our furry friends, like pictures with Santa, treats, and a contest for the ugliest Christmas dog sweater and a dog/owner look-a-like contest; Fun with Frosty & Friends on December 8 includes classic Christmas staples like cookie decorating and a gift market. The annual Lighted Christmas Parade on Boone and Main Streets takes place on December 8 followed by a turkey toss. Churches in the historic district offer a Christmas Church Tour on December 15. The Storytelling Center also offers free gift-wrapping inside for any purchases made in the shops downtown. 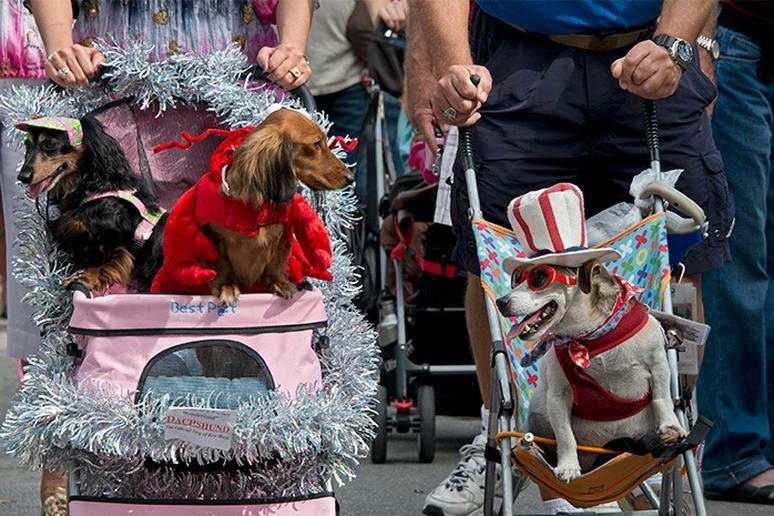 The “Christmas Capital of Texas,” Grapevine has more than 1,400 holiday events in 40 days. A quaint town between Dallas and Fort Worth, Grapevine offers a multitude of ways to get merry this holiday season; events like ICE! at the Gaylord Texan and Snowland at Great Wolf Lodge run from November to January, and North Pole Express and Christmas at the Palace Theatre continue until late December. Beyond the holiday happenings are Sea Life Grapevine, Historic Downtown Grapevine, Grapevine Botanical Gardens at Heritage Park, and wineries like Bingham Family Vineyards and Cross Timbers Winery. Boutiques, jewelry stores, locally owned restaurants, the Grapevine Vintage Railroad, winery tasting rooms, art galleries and fine art working studios line the historic main street. 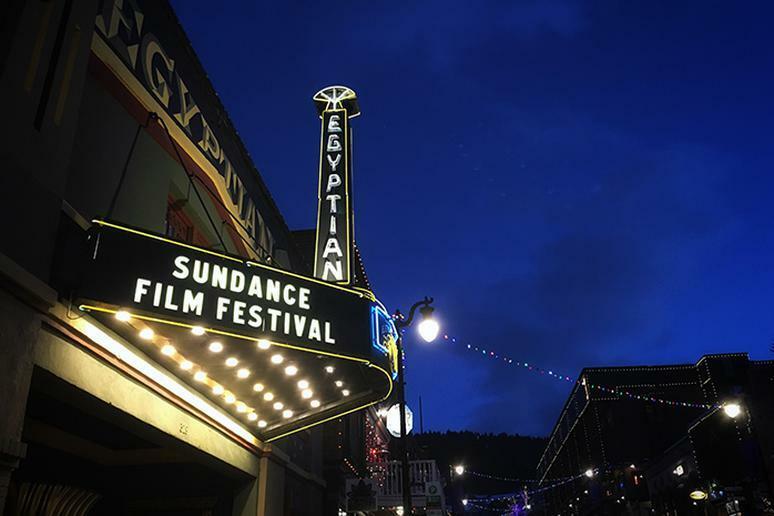 The annual Sundance Film Festival, the largest independent film festival in the U.S., is not to be missed. Take a break from skiing in Park City to watch films from around the world January 24 to February 3. Since 1985, the Utah film festival has attracted tens of thousands of filmgoers annually who attend screenings, filmmaker conversations, panel discussions, and live music events. 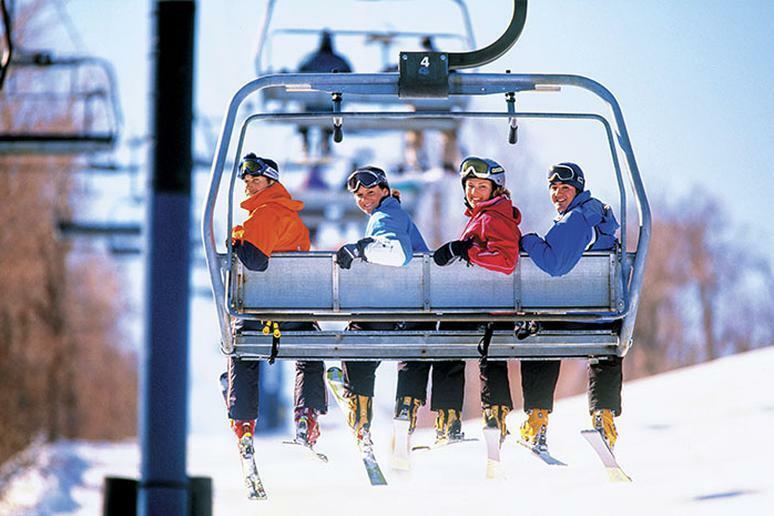 Vermont has 20 alpine ski resorts, 30 cross-country touring centers, and 7,300 acres of alpine terrain. Ski enthusiasts descend on the mountain town of Stowe annually for some of the best skiing in the U.S. The “alpine skiing capital of the East,” Stowe offers extraordinary cross-country skiing with both groomed and backcountry trails. 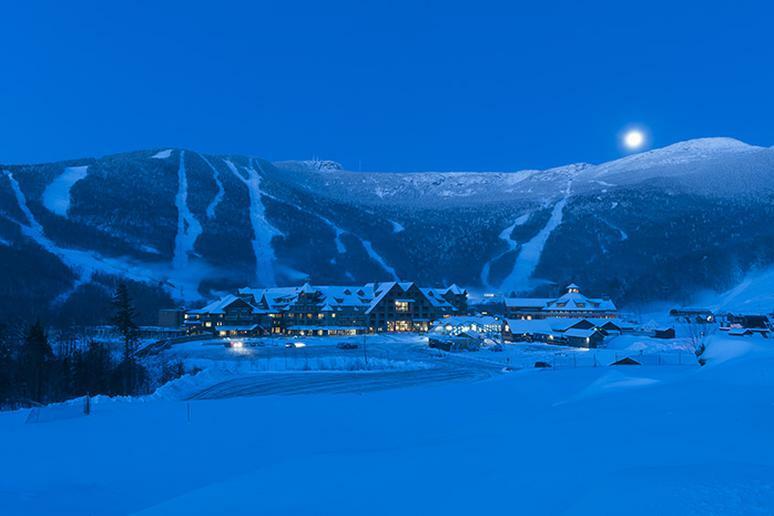 Nestled beside Vermont’s highest peak, Stowe’s extensive trails afford winter enthusiasts the opportunity to partake in dogsledding, snowmobiling, fat biking, sleigh riding, and more in a picture-perfect winter wonderland. Winter is the perfect time to retreat indoors and sample Richmond’s restaurants, breweries, and cideries. Wine enthusiasts can experience tastes from Virginia’s nearly 300 wineries at the Virginia Wine Expo (February 26 to March 3) at Main Street Station in historic Shockoe Bottom. The curated events highlight Virginia wine, spirits, cider and local artisan cuisine. At the Walk-Around Grand Tastings, visitors can sample an assortment of top-shelf wines and Virginia distilled spirits. There is no better time to visit The Summit House at Crystal Mountain Resort, which has the highest-elevation dining experience in the entire state of Washington, than during winter. Visitors take a scenic gondola ride up to the top of Crystal Mountain where on a clear day they will be treated to epic views of Mount Rainier and mouthwatering food. 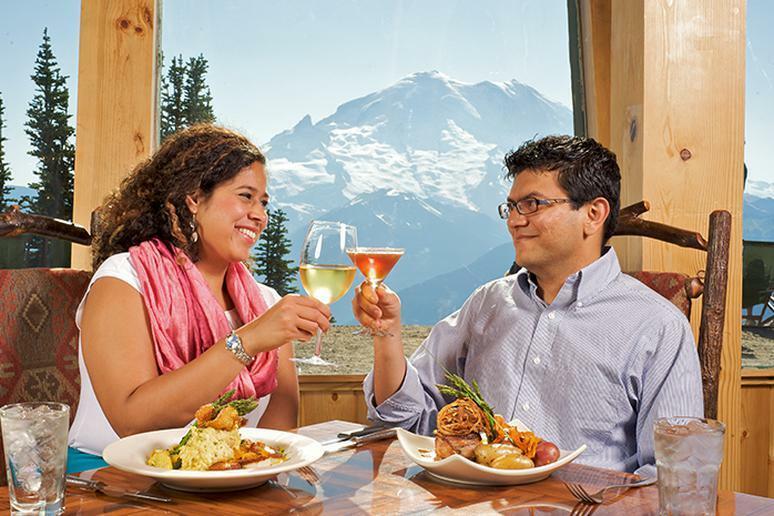 The Summit House is a full-service restaurant perched at 6,872 feet, with absolutely breathtaking views of Mount Rainier and the surrounding Cascades! 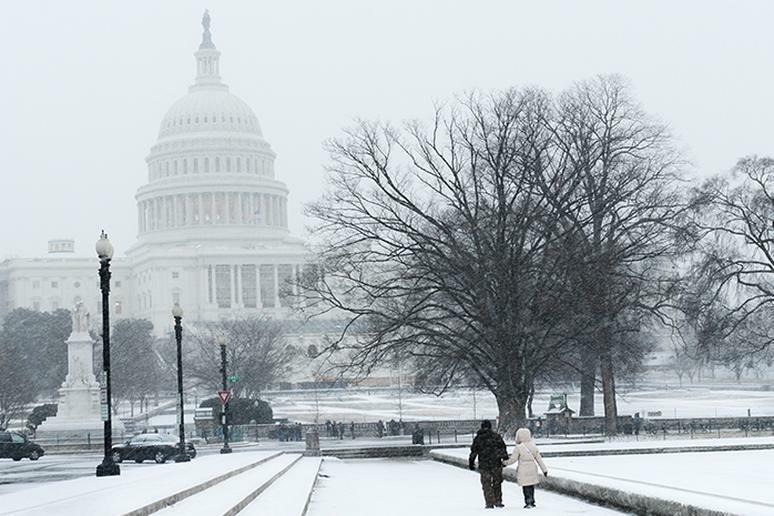 There are a multitude of wintry attractions in Washington, D.C., from the traditional National Christmas Tree to the unique Winter Igloos at The Watergate Hotel in Foggy Bottom. Located on the patio of the hotel’s Next Whisky Bar, the heated igloos hold up to eight guests. The Winter Igloos are open daily until February 28. 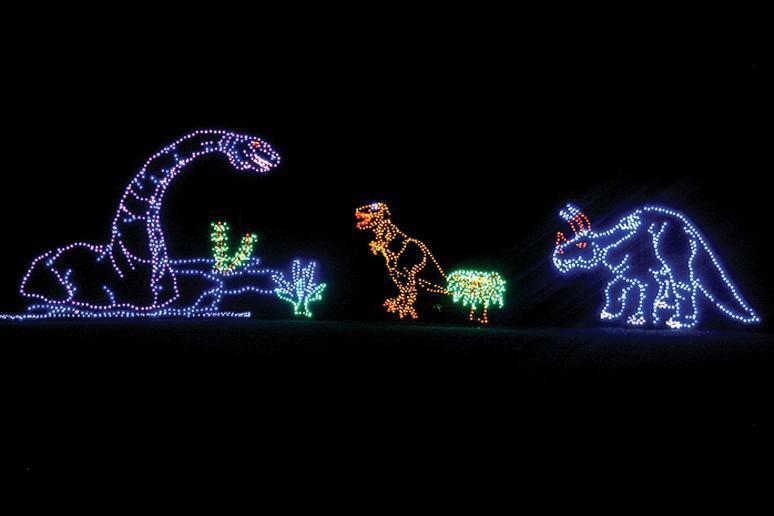 One of the nation’s largest light displays, the Winter Festival of Lights at Oglebay Resort in West Virginia spans 300 acres along a 6-mile drive. 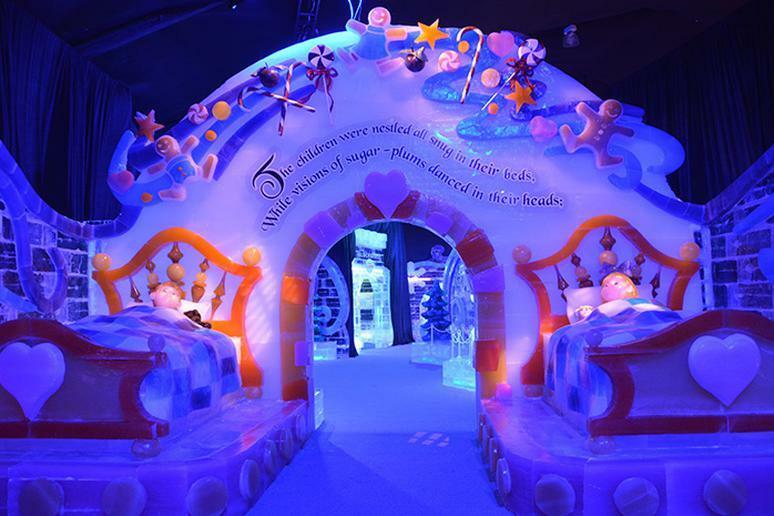 The festival’s 90 lighted attractions include a 300-foot-long Rainbow Tunnel, Peanuts characters and Cinderella. One of the most magical displays features 150 shimmering hanging baskets in The Gardens of Light tour at the Mansion Museum, lighting your entry to the Christmas Tree Garden. 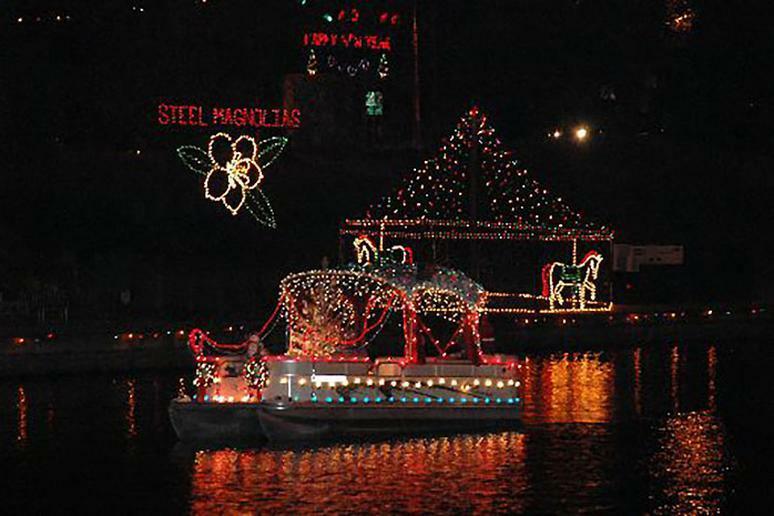 Tour the light displays from your own vehicle or experience the lights from the comfort of a warm Oglebay Trolley. 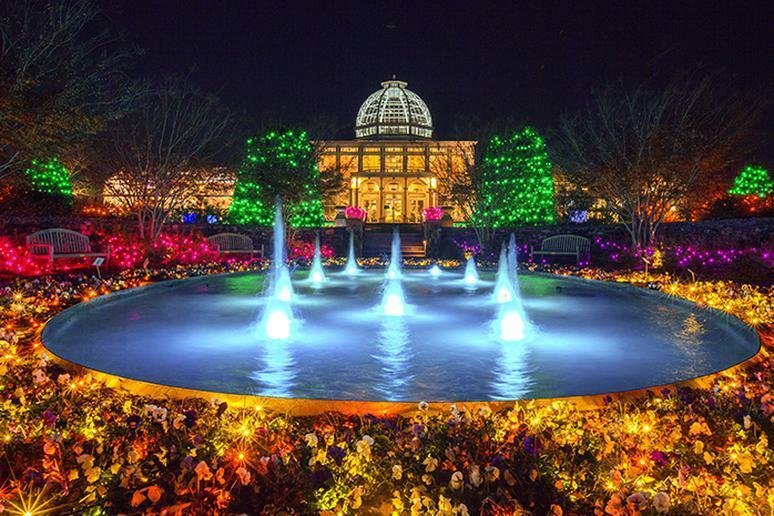 Visitors can experience the magic at dusk each night until January 1. 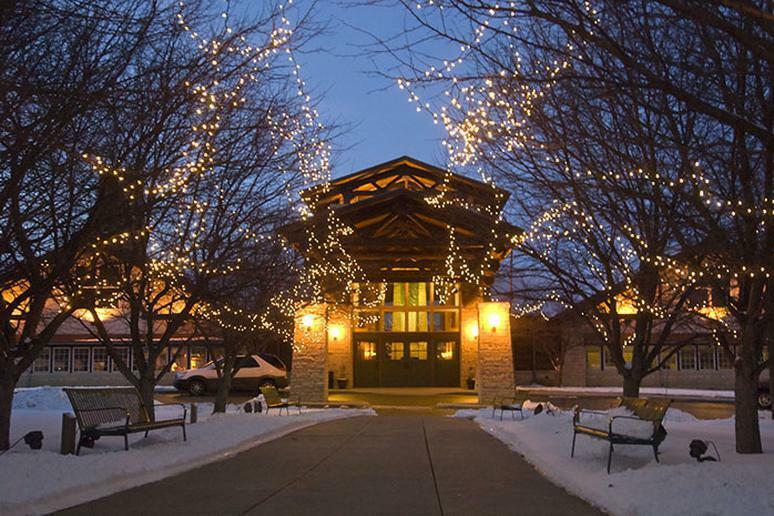 On the shores of one of the biggest lakes in Wisconsin, Lake Geneva offers a plethora of wintertime activities, from pampering and relaxation at one of the many area spas or taking a stroll on the shore path or browsing the unique shops downtown, there is something for everyone. Winter zip lining adventures, snowboarding, sledding, snowshoeing, and skiing are all popular pastimes in this wintery wonderland just north of the Illinois border. 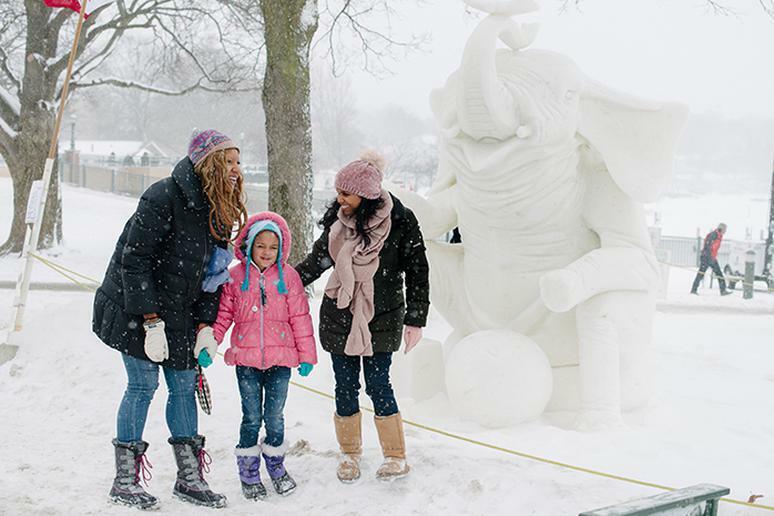 Time your visit for the annual Winterfest and the U.S. National Snow Sculpting Competition held for two weeks every February. On January 26,, Winterfest kicks off with the U.S. Hovercraft Lake Geneva Challenge. The festival includes helicopter rides, cocoa crawl, chili cook-off, an ice bar and so much more. This winter will also bring the spectacular Ice Castles to Lake Geneva (they are usually constructed late December or early January to coincide with snow). The glittering castles, made of hundreds of thousands of icicles that are sculpted into arches, towers, slides, thrones and tunnels, will be constructed near the Riviera along the lake. 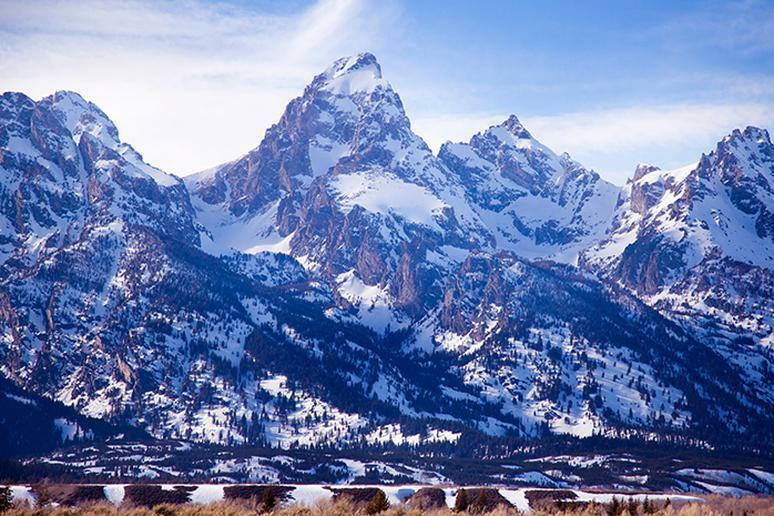 Jackson Hole’s three area ski resorts boast more than 5,500 acres of terrain, ranging from the mellowest of beginner slopes to the infamous Corbets Couloir, one of the world’s hardest ski runs. Jackson Hole Mountain Resort, the largest of the three, recently opened a new gondola to mid-mountain this season for quick access to the majority of the mountain’s intermediate terrain. Grand Targhee, on the other side of the Teton Range, is known for its powder stashes lasting many days after a storm, while Snow King, the “local hill” offers a variety of skiing terrain along with snow tubing, the Cowboy Coaster, and the Treetop Adventure Ropes Course. Located in Wyoming’s northwest corner near Grand Teton National Park and Yellowstone National Park, when the valley is blanketed in snow (annual snowfall accumulations in Teton Village range from more than 500 inches at 10,000 feet, while the valley floor at 6,000 feet receives 280 inches), there is nothing quite like this resort located in one of the best places in the country for a winter break.